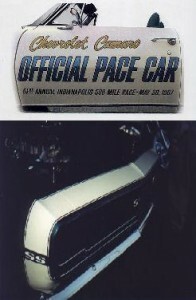 New replacement door decals for your 1967 Camaro Pace Car Edition. These are are very rare so restoring your original one or creating a tribute is easy with our decal kits! Produced by Phoenix Graphix our kits are the industry best! We have the kit ship directly to you also ensuring you get a "fresh kit and not one which has been sitting on a shelf for years! Use the drop down menu box if you would like to add the nose "Bumble Bee" Stripe in either stencil kit or decal kit! 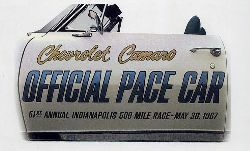 New replacement door decals for your 1967 Camaro Pace Car Edition.